The issue isn't with NAT-T IPSec (port 4500 UDP encasulation) on IPv4. That works fine as it's tunelling over UDP. The issue is with IP->next header->50 ESP encapsultion (pure ESP IPSec). It's definitely a problem on IPv6 and while I haven't tested, probably on IPv4 as well. IPv4 protocol 41 (IPv6 encapsulation) has similar performance problems so it seems the issue is with non UDP/TCP/ICMP packets. FreeBSD 11-CURRENT to FreeBSD 11-CURRENT. DO-TOR to DO-TOR over SSH (IPv6) = ~600Mbps. DO-TOR to DO-TOR over SSH over IPSec (ESP) = ~600Mbps. 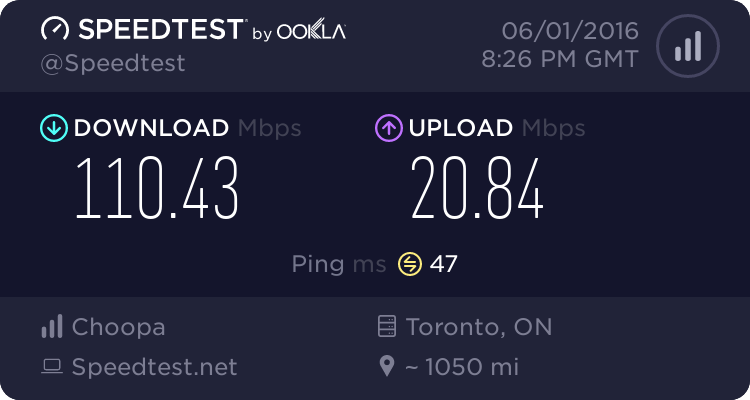 DO-TOR to Rogers 250u over SSH (IPv6) = ~270Mbps. DO-TOR to Rogers 250u over SSH over ESP (Ipv6) = ~20Mbps. Definitely a Rogers protocol 50 (ESP) issue, which Rogers has been able to reproduce on their end (hence why it's in the release notes as a known issue). While this doesn't seem like a big deal right now it will become a very big deal as IPv6 becomes more pervasive. ESP IPSec tunelling is the RFC compliant way to do peer-to-peer in an all IPv6 world. Can you do a speed test that you know for sure traverses one of the ESP links and post the results? If it's good performance, what kind of hardware do you have at the local side (ACSMR?). I've never had reliability issues with ESP over IPv6; just throughput limitation problems. is there something else i need to do at my end to correct this ? Like I said, I haven't noticed any speed issue on my current load. Is the issue only on v6? I used to have about half my traffic over v6 when with Bell. They don't offer native v6 like Rogers does, but I do have a few blocks that I own trough a broker. Essentially, nothing really important goes over v6, work is still tied to v4. @hiho, log into your modem and see if you have two IP addresses in the upper right hand corner of the Status page, one IPV4 and one IPV6, all in the same data area. If so, and you don't pass an IPV6 test, then there is probably an upstream router configuration issue afoot, same that I have from West Ottawa. In bridged mode, you'll need to have a v6 capable router. That also means propagating the v6 IPs on your LAN. You can do it statefull (DHCPv6) or stateless (RA). should i do a backup of my modem/router so i can restore what i have setup now before the factory reset?